Easy Homemade Baby Food – Making Your Own Baby Food has never been so easy. Wholesome baby food.com – Baby food recipes and solid foods for baby website featuring simple Homemade Baby Food Recipes since 2003. Easy to use Introducing Solid Food Guides, making organic baby food and tips and topics to help you feed your baby with wholesome goodness and lots of love. Learn how simple and rewarding (economical & eco-friendly too), it is to make your baby fresh homemade food! Try tasty homemade baby food recipes ranging from easy-peasy simple baby food puree recipes to advanced baby table food recipes. 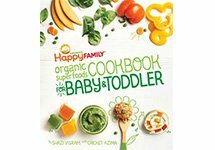 Dig in to nutritious, simple homemade baby food recipes as well as solid food and weaning information. Learn all the reasons why you should make your baby’s food naturally fresh and delicious homemade baby food. One hour per week is all it takes! You can make your baby’s food fresh & tasty in only one hour per week – it really is that easy to make homemade baby food! 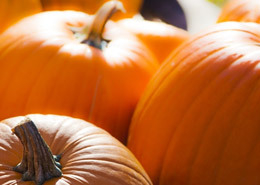 Pumpkin makes a great baby food that’s loaded with Vitamin A & many other important nutrients. Quick Tip – try canned pumpkin in a pinch! Winter Squash is a wonderful, nutritious first food for your baby. 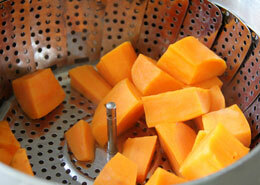 Delicious & very nutritious, squash is sure to be a hit with your little one. Recommendations for introducing eggs to baby are changing! 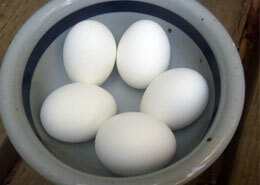 A 2008 study, and many studies done after, show waiting to introduce eggs may not be necessary. 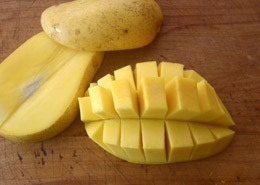 Like Papayas, Mangos are tropical fruits and their age for introduction is varied from 6 months and older with 8-10 months being the average recommended age. Use spices and herbs to liven up baby’s foods. This is a wonderful way to help expand your baby’s taste buds and get her used to the tastes of the family’s foods. Pureeing homemade baby food is very simple. Making homemade food can be done in 1 hour per week! Convenient, creamy, smooth & loaded with nutrients, try Avocado as a first food for your baby. 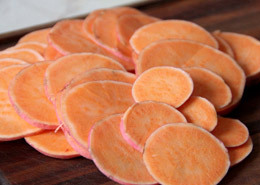 Sweet Potatoes are a very healthy & totally yummy first Food option for baby. How Much Can Baby Eat? 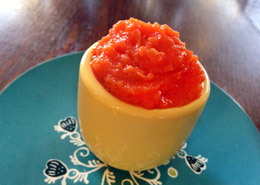 Wholesome Baby Food offers parents easy, simple, healthy recipes to make tasty homemade baby food. You'll learn about introducing solid foods and learn how to whip up a batch of peach mango tango! ALWAYS consult your pediatrician prior to beginning any new food for your infant. 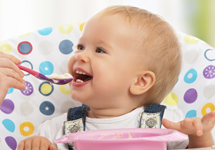 Discuss making homemade baby food with your pediatrician and visit our Baby Solid Food Charts for information regarding what foods to introduce to baby and when. You may also wish to visit the World Health Organization, the American Academy of Pediatrics, Health Canada, Health Direct - Australia and the Department of Public Health (U.K.) to learn more about baby food and infant feeding.THINK about following the 4 day wait rule when introducing a new food to baby - offer your baby the same new food for 4 days to test for allergies to that food. This applies even when you are making homemade baby food. Never introduce more than 1 new food at a time when first beginning solid foods.ALWAYS use clean hands, clean cooking utensils, preparation surface(s), pots/pans etc. when making and preparing homemade baby food. Cleanliness and Food Safety is a MUST when making homemade baby food.And Finally All babies are different and will not like/tolerate the same foods or food textures. Do Not Despair. You should be willing to experiment with baby solid food for your baby. Offer your baby different foods use different ways of preparing those baby foods and be willing to have a huge store of patience.